Getting Ready to start my first String Quilt. As a scrappy quilter, I am, of course, attracted to string quilts. Since seeing Stacey's method of using two colour combos of scraps I am even more attracted. So...I spent the last few days sorting all my scraps into colour piles. And I was also able to sort out all the teeny-tiny pieces for crumb quilt blocks. 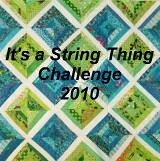 My 2010 personal quilting resolution is to use up all my scraps and I have tons of scraps. I inherited my quilting buddy's scraps when she passed away so lots of memories will go into these scrap quilts I am going to make this year. I will post a block or two when I get a few completed.